Musselburgh CC Vice President Alastair Hare passed away on the 5th of April, after a recent diagnosis of liver cancer. Alastair played for the club for over 50 years, and also gave amazing service off the pitch in many ways. Alastair’s contribution to the club was recognised when he was made a Vice President and Life Member of the club, and he continued playing into his 70s. He may have been past his prime at that point, but the club was struggling for numbers and Alastair still bowled and fielded in the gully despite his advancing years – a true clubman. 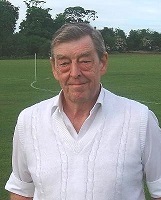 He donated the Al ‘Gully’ Hare trophy for outfield catches to the club in 2002, having previously donated the 2nd XI Bowling Trophy when he was one of the forces behind creating the 2nd XI in 1980. Even once he finally retired from playing Alastair retained a keen interest in the club’s progress, coming along to the AGMs and always staying in touch. Outwith cricket he played an active role in civic life, with the Old Musselburgh Club benefitting from his interest in and support for local life in Musselburgh. Alastair could also be found knocking doors selling voting cards for the annual Honest Lad and Lass elections as part of his involvement with the Honest Toun Association. Alastair will be missed by a huge number of people, none more so than his wife Doreen to whom we send our condolences and best wishes. Alastair’s son Iain was also a player with the club for long time, and we share his sense of loss. Many of the players both at Musselburgh and at other clubs from Alastair’s playing career (early 50s to 2004) may no longer be actively involved with cricket, so please pass on the sad news to anyone you know who may not know of his passing. Alastair’s funeral is on Tuesday 18th April at 1pm, Seafield Crematorium. No flowers please, but there will be a collection for Marie Curie. The gathering afterwards will be at the Kings Manor, all who attend the service will be very welcome.